Mention lightweight to any member of my family from grandchild on up and they know exactly what you are talking about. Lightweights are light weight pack canoes that came about out of a desperation to find a better way to go on canoe camping trips. Here is a lightweight. 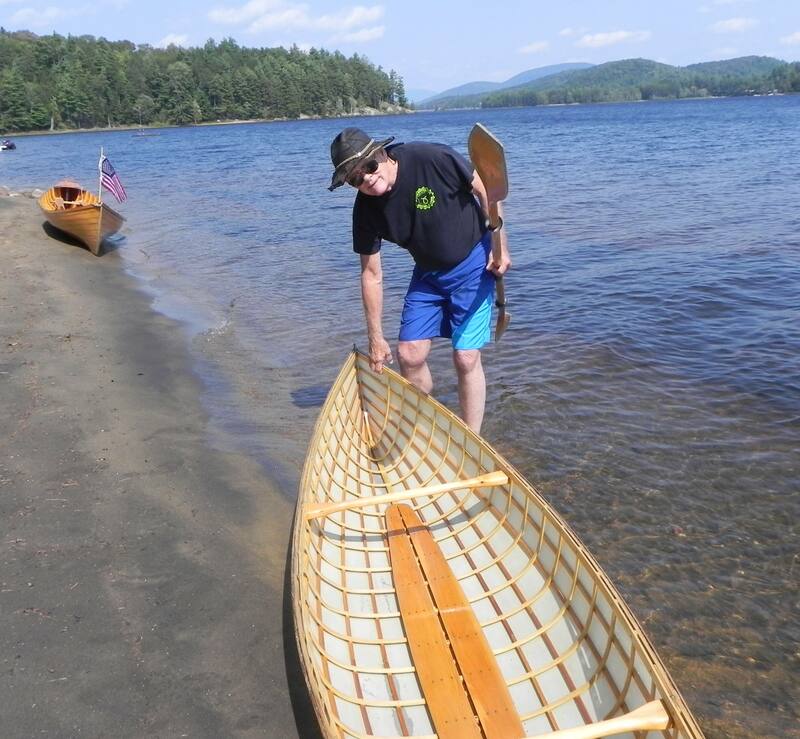 A lightweight canoe on a Long Lake beach. More on these charming craft after I tell you what drove me to build one (actually I have built about a dozen lightweights). My son Stew and I decided to take a canoe trip starting in the Saint Regis Canoe Area in the Adirondack Park. It was to be a three day trip that would take us through the Canoe Area and into the Saranac Lakes and ending in the Lower Saranac Lake. The only canoe we had at the time was our 90 pound Coleman “Tupperware” canoe as I call it. We soon found that the carries we were to encounter along our chosen route would test along our fortitude. We would need to traverse the Nine Carries Route and the Seven Carries Route. You get the idea. The carries were not the only problem. Soon after getting underway we encountered a huge white pine blow down across one carry. It required lifting our canoe almost head high in order to shove it over the obstacle. The payoff occurred when coming out of the St. Regis Canoe Area. We needed to find our way through the network of ponds that led into Upper Saranac Lake. On the carries we portaged the canoe upside down so our visibility was quite limited. This caused us to miss a critical turn on one carry. We began walking down a very nicely paved path with mowed grass on each side. I said to Stew “This doesn’t look right. Let’s drop the canoe and take a look around”. We dropped the canoe with a clatter and a bang (there were metal pails for washing dishes hanging from the boat. We were quite a sight!). It turned out that we were right next to the first tee of the Saranac Golf Course and there were several gentlemen ready to tee off. This was bad enough but our “detour” took us out of the way by about a half mile. As soon as I got home I began to search for a better option for canoe pack trips. I came across Geodesic Airolite boats by an inventor, Platt Monfort. 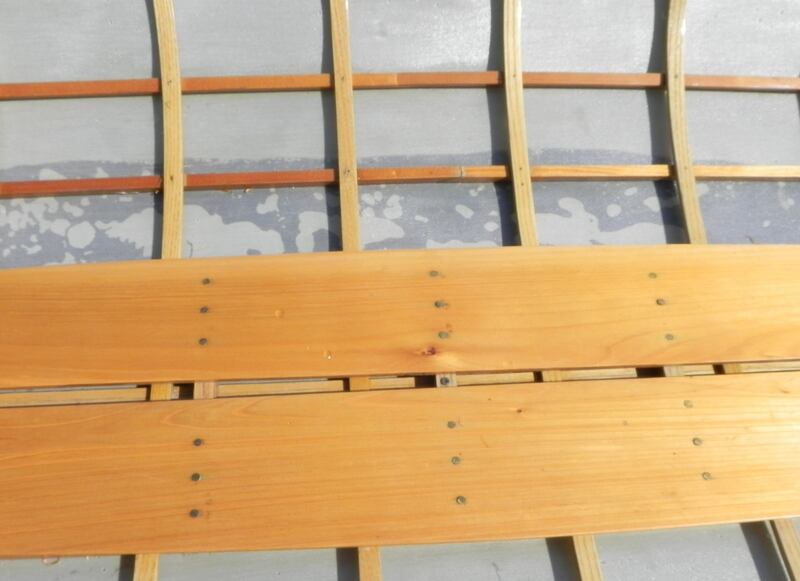 These boats essentially consist of a light wooden frame covered with aircraft heat shrinkable Dacron. Platt promoted his boats as easy to build and they certainly are. 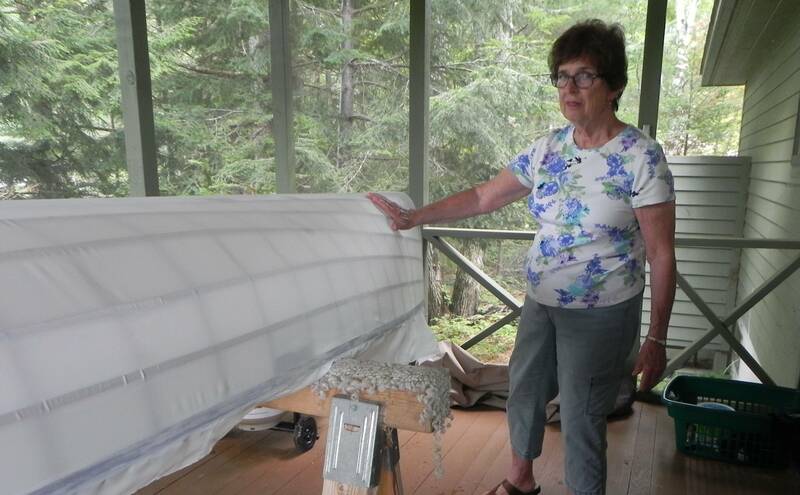 The boat shown above is 24 years old and weighs about 18 lbs. 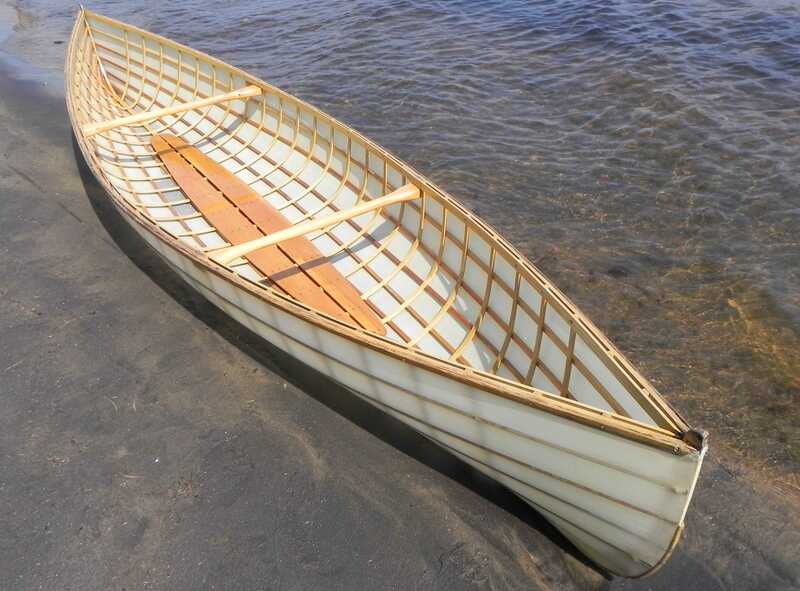 My family loves to paddle about in them and I have sold four of them. They are sturdy and can carry about 200 lbs. One of our lightweights was inadvertently left outside over the winter. Algae had grown on the covering which was need of replacement anyway. Here it is before removing the old covering. 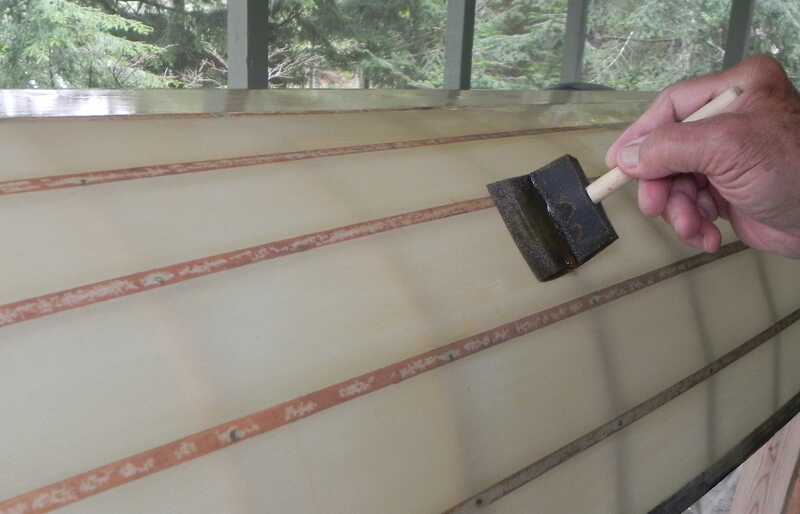 Lightweight canoe before removing the old covering. After removing the rub strips and stem band the old cover is taken off. 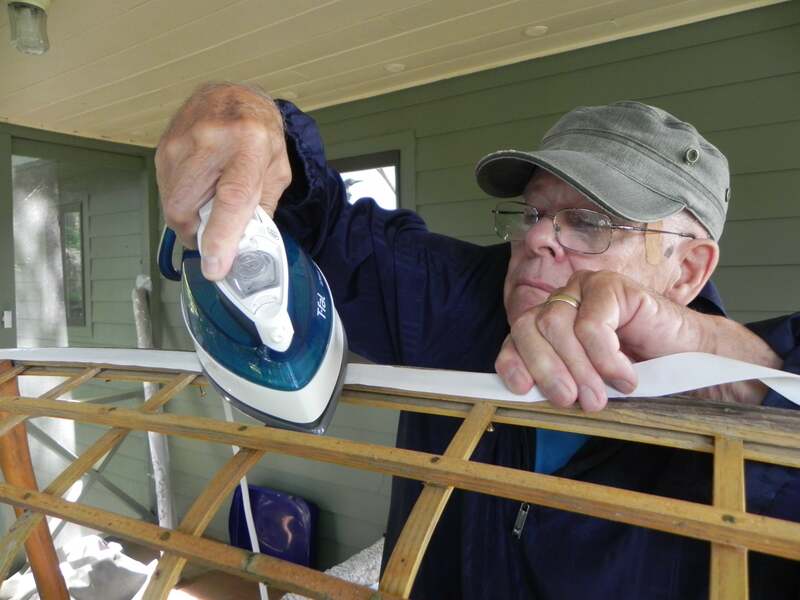 Next, a fabric adhesive called Heat N’ Bond is applied to the inwales. It is applied with an iron. Applying Heat N’ Bond to the inwales. The aircraft grade Dacron (3 oz per yard) is spread over the frame and attached to the inwales. 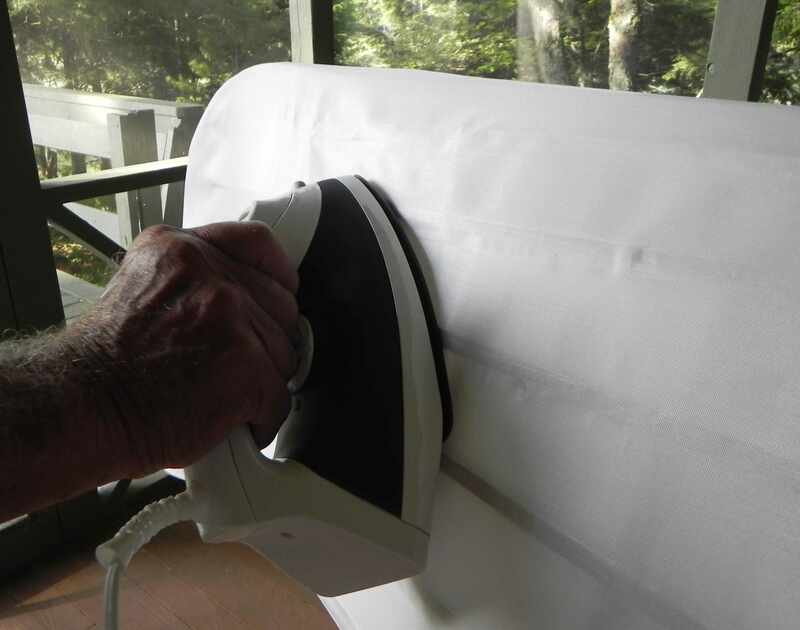 This is done by applying a hot iron along the inwale to activate the Heat N’ Bond adhesive. Dacron cloth over the frame. 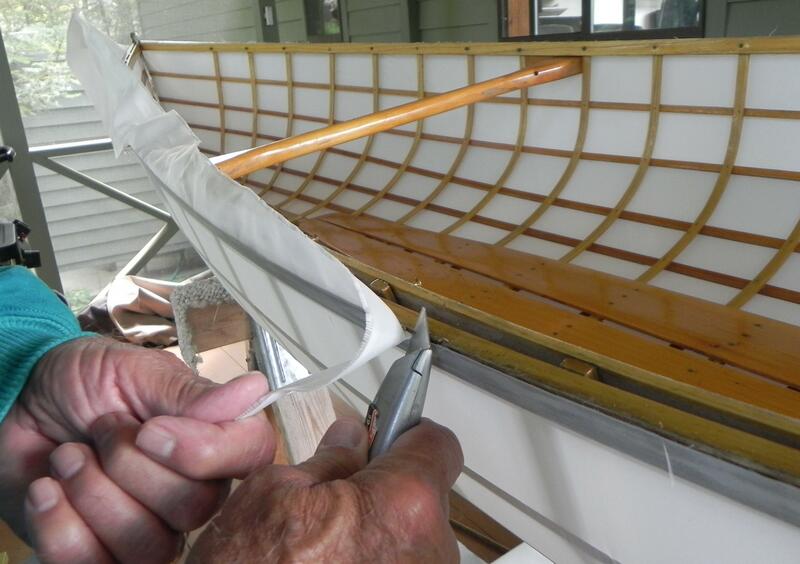 The Dacron is heat shrunk starting at the center of the boat and moving toward each stem. I use a steam iron which works really well. 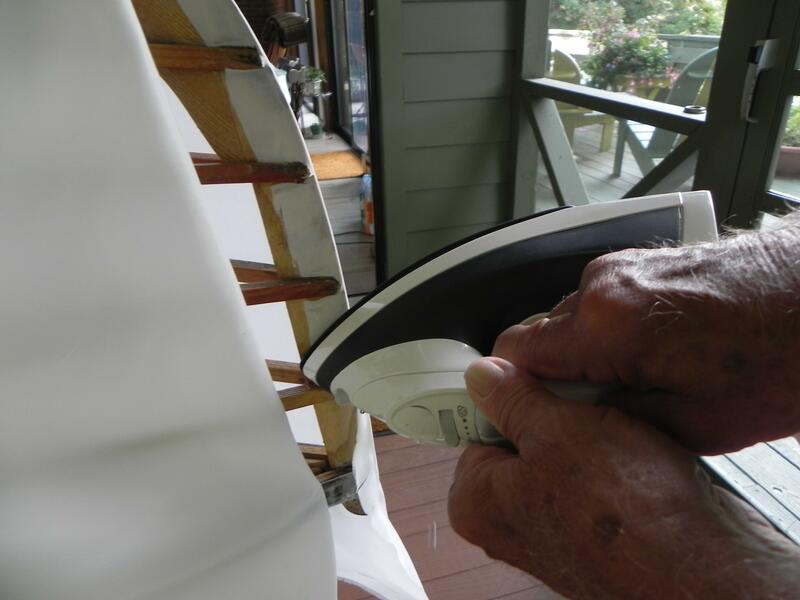 Heat shrinking the Dacron using a steam iron. At each stem the Dacron is wrapped around and adhered using Heat N’ Bond. Wrapping the Dacron around the stem. Dacron is cut away where the stringers meet the stem. Heat N’ Bond was previously applied to the stem. The Dacron is now glued to the stem using an iron. Gluing the Dacron to the stem. Heat N’ Bond is applied to the end of the stem so that the Dacron on the left had side can be attached. A final check to see if the Dacron is taut all around. A final check of the heat shrink. Now the excess cloth is trimmed away. Trimming excess cloth along the shear. Trimming excess cloth off the stems. 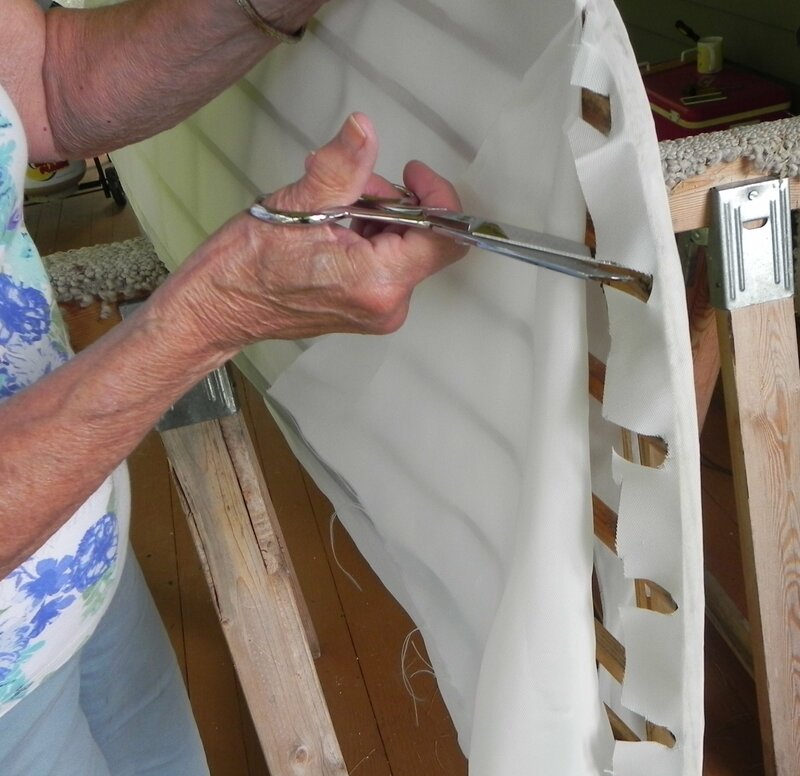 The cloth is given three coats of marine spar varnish to render the hull water tight. 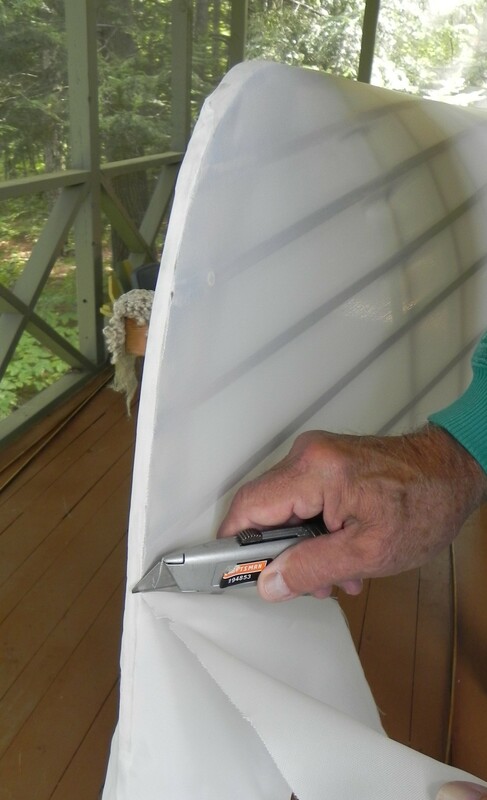 Appying marine spar varnish to make hull water tight. The boat is now like new and ready for many more launches. 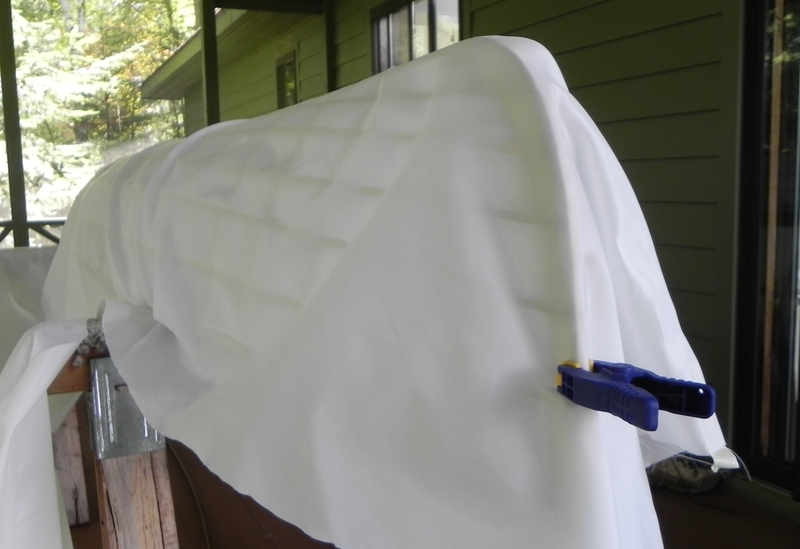 Lightweight canoe with its new cover. One really fun thing about these little boats is that the translucent skin lets you see the water passing by as you paddle. Here the boat is lying in shallow water and you can see bubbles clinging to the hull. Bubbles cling to the skin covering. The wind was so bad that I had to wait for a calmer day to paddle out in the refurbished lightweight. Here is a view from mid-ships in the lightweight canoe on a sparkling clear fall day on Long Lake. 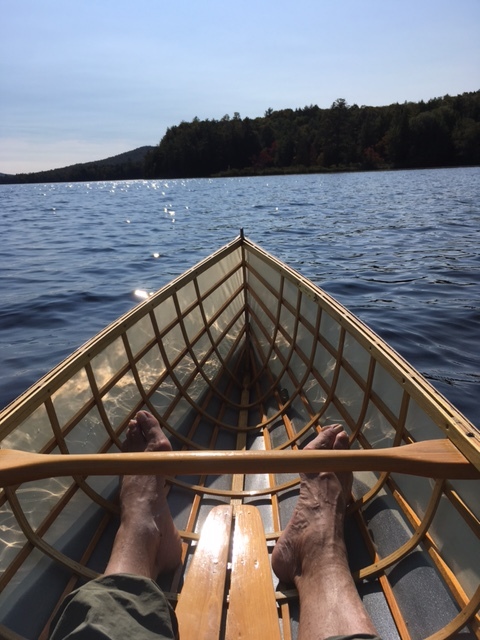 Cruising on Long Lake in a lightweight canoe. Notice that the waterline is visible that the sun reflects off the waves and onto the covering.